Is the user interface moving in the direction of the physics engine? For some time we are looking with interest to those who connecting physics with a user interface. BumpTop is one of the most interesting for me. It seems to me that the addition of physics to the user interface when using touch screens can significantly improve the quality of user interaction with the program. 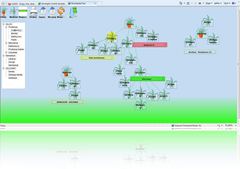 I have to create a program which will create the organizational structure on a spider plant. The principle of the creation of such charts Gareth Morgan suggested in his book "Organizational behavior". I really like these structures. 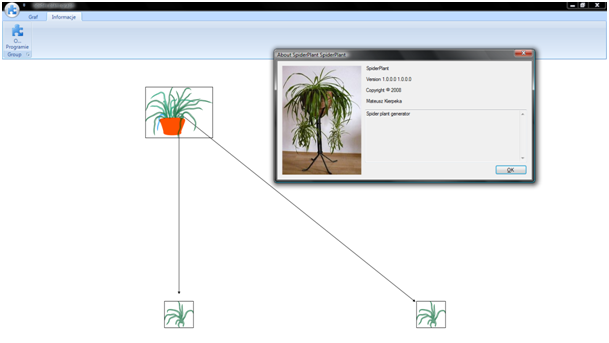 From the time I sow spider plant structures I thought I can make such a program for creating graphs (something like Visio / Dia). I asked Professor Michal Jasienski about that instead of the making analysis on the Behavior Organizing I would like to write a program that will create such graphs. I received agreement and I immediately start to write program. In the first approach I made "normal" Windows application. After the presentation I received a number of minor comments, which resulted in that I had to change the approach to the creation of the charts. Since I had experience in creating graphics using the game engines I decided to use it to meet the new requirements. Program should work also on Apple computers so, I chose Silverlight. The first presentation for a friend allowed me to know that everything is ok, but ... This is yet another program to create diagrams and something similar could be accessed by other programs ( "not so easily, but why install another? “). Here, after more tests (more than a week), and presented the next version and comments were very positive! Minor observations (lack of removal of objects, undo operation, etc.). I received a number of examples of charts, some very nice comments and opinions about the program. How I made this program? The look and feel I made in the Microsoft Expression Blend 2, then started to work on the application in Visual Studio 2008. After designing the core of application, the Farseer physics engine was chosen. In 5 days I made all stuff (I have few problems with physics and some problems with storing data, printing, saving screenshots etc). The effect of work you can see on the page http://kierepka.pl/silverspider/.